Since the PageSpeed data for your single pages is loaded from Google Analytics via the API, it is particularly important to properly set up this connection for the analysis in BAVOKO SEO Tools. Usually Google Analytics only measures and saves the loading times of just one percent of all your page views, but this “siteSpeedSampleRate” can be set to 100% by adjusting the tracking code, which then records all page views. Since Google Analytics can be integrated into the website in various ways, we will explain the two most frequently used setup methods below. Please note that this code works for the analytics.js tracking code. Depending on which version you are using, this must be adapted. 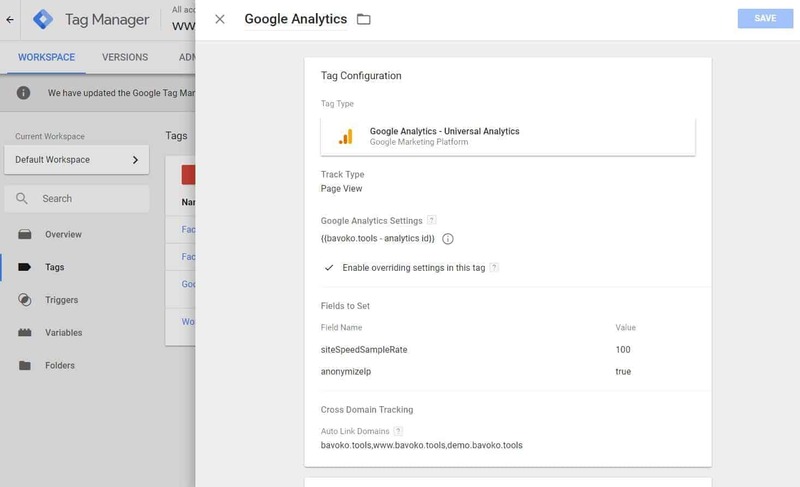 Log in to the Google Tag Manager. Click on “Tags” in the sidebar. Open the tag you set Google Analytics up in. Click on “Fields to set” when configuring the tag. Enter “siteSpeedSampleRate” in the field name and set the number “100” for “Value”. By changing the siteSpeedSampleRate to 100, you ensure that 100% of your page views are tracked. After a successful connection to the Google Search Console, BAVOKO SEO Tools provides you with even more detailed and accurate analyses.